I wanted to have a small version of the htbh that can be moved and that I could aslo use to host very small colonies. I also wanted to validate the design for the next full size hives I'm going to build. This is really a luxury hive (it only misses the side window) and some parts could be simplified or skipped. This one has small plastic feet to protect the side panels. It comes with four rotating entrances in case I want to keep a virgin queen for some times. 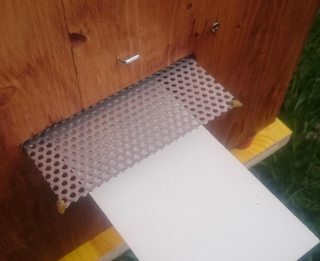 The side panel gives access to moveable varroa mesh and varroa floor for inspection and cleaning. 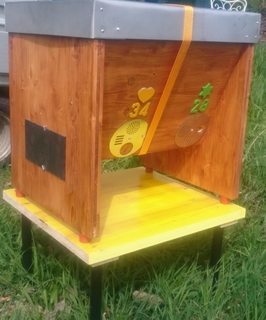 The hive can host twelve bars and there are three removable separators. I'll build vertical feeders if I need to feed them. This is my third design. I like the deep bottom that can host a mesh and a board, a mesh only or even a drawer for a natural floor. It also allows me to evaporate oxalic acid to remove varroas. I usually made more complex roofs but this time I wanted to have a simple and "easy" made one, it only has one inch of foam for insulation. This is a prototype vertical feeder. 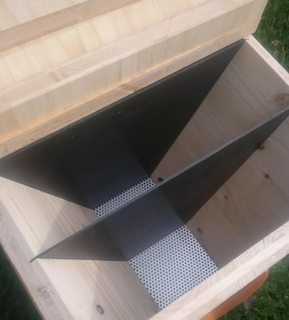 I usually worked with standard horizontal feeders (I've some feeding bars with holes) but they require an deep roof, this one will be fine for my mini hive with simple roof. It can bee filled with sirup or fondant. 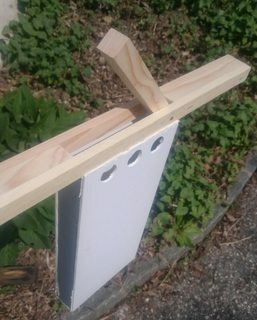 The entrance holes for bees are too big, they should be only 4-5 mm wide. It contains nearly 1 liter and is made of expansed PVC.